Bad Left Hook reports that Floyd Mayweather is upset with the current HBO offering of its 24/7 series with Miguel Cotto. Mayweather believes that the producers have edited out footage he believes would be more entertaining. After this past Saturday’s episode, Mayweather tweeted his displeasure for the show and stated that the Mayweather camp had “exciting content” which was not used. As BLH points out, the 24/7 franchise is wearing thin when it features either Mayweather or Manny Pacquiao. There’s only so much that you can show of either fighter when most of the world awaits for them to fight. The 24/7 series is a great platform to promote boxing. As such, it should take a break from Mayweather and Pacquiao and focus on another compelling fight. And just do one episode. Perhaps the problem is that there are three or four episodes which makes the series repetitive. With big HBO PPV fights being promoted on multiple Time Warner networks, its likely we will continue to see the 24/7 series. While its stale to HBO viewers, the experience is relatively new to those watching it on CNN. What would be more entertaining to promote fights is to show past fights to show how exciting the upcoming fight will be. The Audience Network does this and HBO has in the past. However, I’m sure there’s a need for original content and 24/7 still does it the best. MMA Junkie reports that the eighth episode of TUF Live averaged 929,000 viewers. Its the lowest ratings ever for the TUF series. Did Zuffa execs think that the TUF franchise would fall this far in the ratings when moving it to FX and on Fridays? TUF Live went unopposed (no Bellator) last week and fell to the lowest point in the franchise. Its a sign that viewers are not really interested in this season. The pro wrestling post: Eyeblack, WWE pre-PPV hype and Bellator to Thursdays on Spike? Welcome to another edition of the pro wrestling post. Former WWE superstar Shawn Michaels has signed an endorsement deal with Eyeblack. The company produces under-eye eyeblack with phrases and logo. Seattle Seahawks running back Marshawn Lynch is also sponsored by Eyeblack. Payout Take: A nice quid pro quo for Michaels. A portion of the deal was for use of Michaels trademarked phrases. It is a nice product placement for Michaels’ hunting show. But, in general, just what real purpose do the eyeblack strips have? Couldn’t you wear sunglasses to keep the sun out of your eyes? TNA is not doing too bad in the ratings right now. This past week it averaged 1.4 million viewers with a 0.99 rating which was up from the previous week. Bear in mind, the ratings are much better than either Bellator or TUF Live. Payout Take: Acknowledging the competition and moving it to a slot where it may get move viewers is a good move by TNA and Spike TV. The move likely is gearing up for this fall when the NFL will have more games on Thursday nights throughout the fall. It could also mean sliding in Bellator at 10pm in 2013 with TNA as a solid lead-in and moving it off of Friday nights. Without its network, the WWE is utilizing its other social media to promote this Sunday’s PPV which features Brock Lesnar. Earlier this year, the WWE used its YouTube channel to promote Wrestlemania this past year and returns to it to feature a match. Cageside Seats reports that the live pre-show will appear on its Facebook, WWE.com and YouTube channel. The additional free match should draw viewers to one of the outlets and perhaps draw additional buys. Payout Take: The move helps market Lesnar’s return to WWE PPV and serves as a monitor as to how well visited its social media, especially its YouTube channel is visited. The WWE has produced original content for the channel and it may be a default place for the WWE while it waits for its Network to hit. MMA Fighting reports that Nick Diaz has filed a lawsuit against the Nevada State Athletic Commission. In addition, Diaz’s attorney filed a preliminary injunction which would stay Diaz’s suspension related to his failed drug test from UFC 143. The suit is asking the court to immediately stay the summary suspension handed out to Diaz by the NSAC as well as to enjoin the NSAC from going ahead in any further disciplinary proceedings. Diaz’s complaint also asks the court to declare his due process rights have been violated by the NSAC’s failure to promptly convene a hearing to determine the merits of the disciplinary complaint against him. Diaz’s attorney stated that according to statute, Diaz’s disciplinary hearing must have been heard within 45 days of the temporary suspension or it would consider the complaint dismissed. However, Diaz failed to appear at a temporary suspension hearing according to the NSAC. This will be interesting to see how the court rules on April 14th – the date of the preliminary injunction hearing. Diaz is not challenging the merits of the NSAC’s complaint, but the process. This could have major implications for the NSAC and athletic commissions on a broader scale as it relates to how it governs. Diaz indicates that he is ready to fight immediately if the suspension is lifted. This could be helpful for the UFC for its late summer/fall schedule as a rematch with Carlos Condit would fill a PPV main event in prelude to a GSP showdown in Montreal. Diaz’s primary complaint is that the NSAC has not acted within the statutory regulations provided by the state of Nevada which relates to his other complaint of lack of due process. Essentially, Diaz states that the temporary suspension required the NSAC to have a full hearing on the merits of his drug test and subsequent suspension. That has not happened. The NSAC had served Diaz with an Amended Complaint which adds the fact that Diaz lied on his pre-fight questionnaire. The NSAC may argue that the amendment to its original Complaint equated to additional time required prior to a full hearing on the merits. Another interesting observation is the explanation from Diaz’s camp that it did not challenge the initial “Summary Suspension” due to the reliance that it would receive a full hearing “in the near future.” Diaz’s legal counsel does a good job in laying out dates of its continued request to the NSAC as to when Diaz may receive a hearing. It’s an interesting legal strategy and its plausible that the injunction may be granted. The Sports Business Journal reports that Fox Sports and boxing promoter Golden Boy Promotions have entered into a multiyear, six figure agreement. The deal will give Fox Sports live events on Fox Deportes and Fuel TV. At least one live event each month will be shown on the Fox networks although no plans are in the offing for a boxing event on the major Fox channel. According to the SBJ, the deal is significant as Fox paid a six-figure rights fee to Golden Boy for the events. The rights fee is a sign that boxing is gaining steam once again as rights fees for boxing on basic cable were nonexistent in recent memory. The deal is for 15 months with options to extend it multiple years. The move reflects the commitment Fox has to combat sports for its smaller cable channels. It shows its belief in broadcasting live sports content as a way to attract its target demos of mainly younger males. Is boxing on its way back? Just a while back we talked about the problems with the sport and whether it could make a comeback. So far, we’ve seen NBC Sports Network with a quarterly show, the talk of Spike TV having boxing and now the Fox deal. Certainly, the Fox deal is important due to the type of exposure it can receive over the span of the Fox networks. If it does do well, we could see its return on Fox. Its a nice hedge on the part of Fox to see if audiences will gravitate to boxing again. It is interesting that Fox did pay a rights fee to Golden Boy. One would think that Fox would have the bargaining leverage in the negotiations. MMA Junkie reports the salaries for UFC 145 as released by the Georgia Athletic and Entertainment Commission. Jon Jones and Rashad Evans were at the top of the $1.2 million payroll. It’s interesting that Ben Rothwell was third highest on the payroll. Also Efrain Escudero’s return to the UFC meant a pay cut from his TUF winner contract. “Wonderboy” was the only fighter making less than $10,000. A rather low payroll despite the fact that $700,000 of the payroll was dedicated to the main event. MMA Junkie reports that Bellator 66 ratings received an average of 106,000 viewers last Friday. The ratings are disappointing considering it was headlined by Eddie Alvarez versus Shinya Aoki. The 106,000 viewers is a sharp decrease from last week’s 163,000 viewer average. It is also the third worst average in Bellator/MTV2 history. MMA Junkie suggested that its site as well as others aired the prelims and main event fights online which could have detracted from the television average. The roller coaster continues with the Bellator ratings. Even with it being a UFC PPV weekend, Bellator had a solid main event that was not worthy of a 103,000 viewer average. With Hector Lombard leaving for the UFC, Bellator is down one of its top stars. Bellator will need to ensure that it keeps and cultivates its top fighters so that the company can have a face. 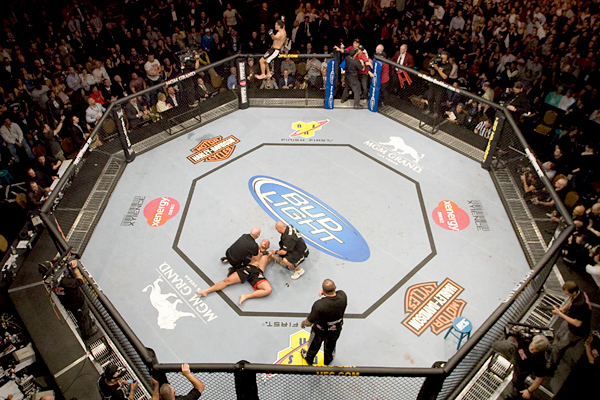 MMA Weekly reports that the prelims for UFC 145 on FX scored an average of 1.6 million viewers. The ratings are a network high for the UFC Prelims on FX. The ratings reflect the fact that the UFC on FX is increasing its ratings average each time its on the network. Despite the downturn in viewers to TUF Live on FX Fridays, it seems that fans are finding the UFC Prelims on FX just fine. UFC 145 Prelims tied for third all-time in terms of ratings for televised prelims on Spike TV and FX. Positive news for the UFC and FX. For the UFC, the high viewership helps with the probability that those fans were likely buying the PPV. For FX, it shows that the UFC viewership on the network is steadily increasing each time its on the network.